Last January we got terribly excited. 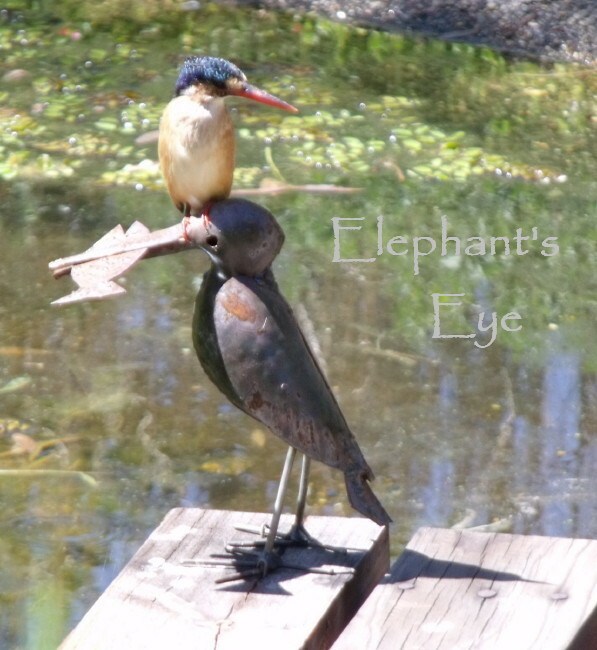 We had an adult kingfisher teaching junior to fish for lunch. Papa said ‘Now watch carefully dear. We dive gracefully, perfectly, like an Olympic Gold Medallist. If those clumsy two-legs listen V E R Y carefully, they may ‘just’ hear me touch the water with my beak.’ And papa flew back into his perch on the tree, and swallowed his Lunch. And poor little junior tried. And tried. And tried. Noisy undignified belly flops. Sodden feathers, which had to be groomed and tidied up. Wait a L O N G time for Lunch to decide it is safe to come out again. But we did eventually see success. Down the hatch. 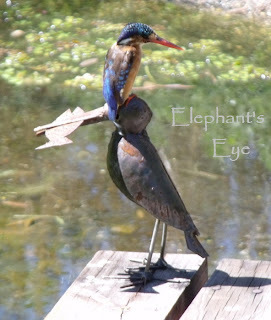 We were delighted when we went to Rustenberg Rare Plant Fair to find this metal ‘bird with fish’. Do you mind? I can't see! Then not a sight or sign of them since. My sister has been staying with us, and who should turn up, while she is here? Our kingfisher! This one is very nearly adult. So he fishes with great skill and determination and persistence. Just like his dear old dad. He will hunt here for quite some time, but any sudden noise or movement and he is SO out of here. Call THAT a kingfisher? I have a body like a penguin! 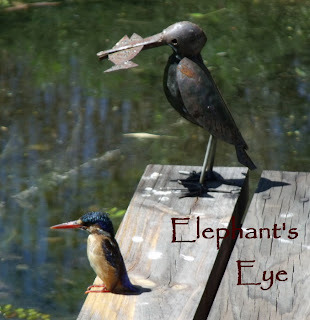 Background info from Joy Frandsen’s Birds of the South Western Cape - Malachite kingfisher. 13 cm. Magnificently colourful. The adult is a rich golden cinnamon, with a white chin. The crest is a metallic blue green, striped with black. The wings are a deep iridescent cobalt blue, and there are matching white marks on the back of the neck. The short tail shares the cobalt and cinnamon colour of the rest of the bird’s plumage. The long bill is bright red, and the legs coral. Young birds have black bills (if you look carefully, you can just see the last of the darkness fading from our bird’s bill). These birds are common at fresh water, where there is vegetation to shelter in. Breeding from September to February. Perches where it can overlook water, and dives for its prey, skimming low over the water. 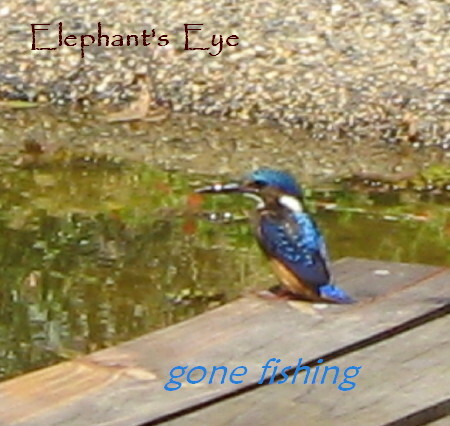 Feeds on (fish, none here) tadpoles, beetles and grasshoppers (mostly the Ungardener’s beloved dragonflies). Turns round very quickly on its perch. PS As I read your comments, I remember one day walking home from work, in Aarau. Joining a few people gazing in wonder at a shimmering blue Eisvogel. The only kingfisher I ever saw in 10 years of living in Switzerland. Dear Diana, How very fortunate you are! I was thrilled with this posting for I have never actually seen a kingfisher close up and the thought of one in the garden is simply wonderful. I believe that they are now quite rare in Britain. Once more, thank you for taking all the time and trouble to explain how to 'link'. I have succeeded in linking back to my own post but in trying to put a link to you, I have failed in spite of many attempts. I have, of course, given you a mention and hope to do better after my break when I shall speak with my computer person. Oh, what a wonderful bird your kingfisher is! Love those photos! What a neat Kingfisher! So colourful. Here, ours blend into the background a lot more lol. And such a cute story you wrote to go along with the pictures! 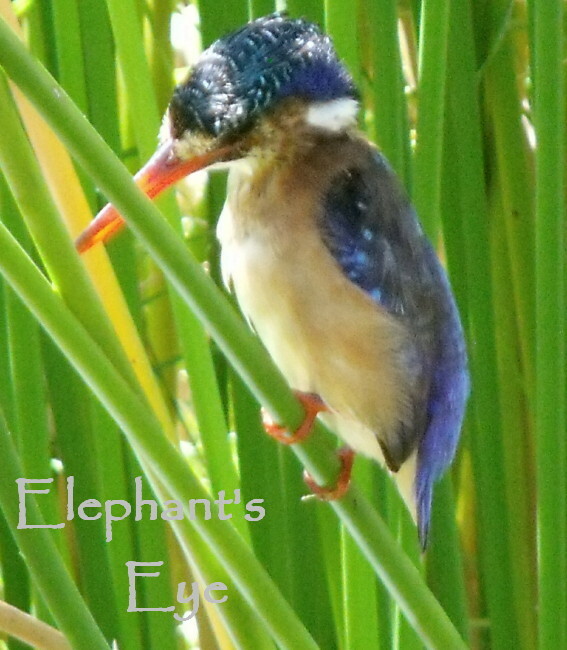 Diana, your Malachite Kingfisher is beautiful! So glad he came back. He really seems to adore your metal bird sculpture with fish! 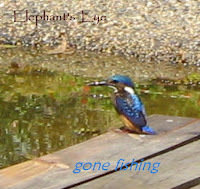 It's a beautiful bird ... we're lucky enough to be able to see kingfishers too. I'm always amazed at their colours and that terrific beak! Great photos. Lovely photos, especially the one standing next to the metal bird! I think somehow the kookaburra and kingfisher are related. I've seen a kingfisher, not here, but at a lake farther north. Impressive birds. South Africa has other, larger kingfishers in quieter, more subtle colours. I think this one is so small, that he is not worth the effort for predators. And so his feathers can be totally over the top, bring on the Christmas Bling! Wish I could have seen the feeding lessons. I've seen Belted Kingfishers but have never gotten a photo.